Volunteer to give a talk to a non-academic audience about your favorite subject in mineralogy, geochemistry, and/or petrology. There are lots of possible venues: K-12 classrooms, mineral clubs, retirement centers, and local museum or library lecture series. You must include an MSA Centennial slide in your talk (see the selection of slides below) and tell your audience that MSA is celebrating its 100th birthday. You are welcome to use a full set of slides that offer a little more about the history of MSA and its activities today. The date of your talk. Your information will then be listed on the MSA Centennial web page for everyone to see!! 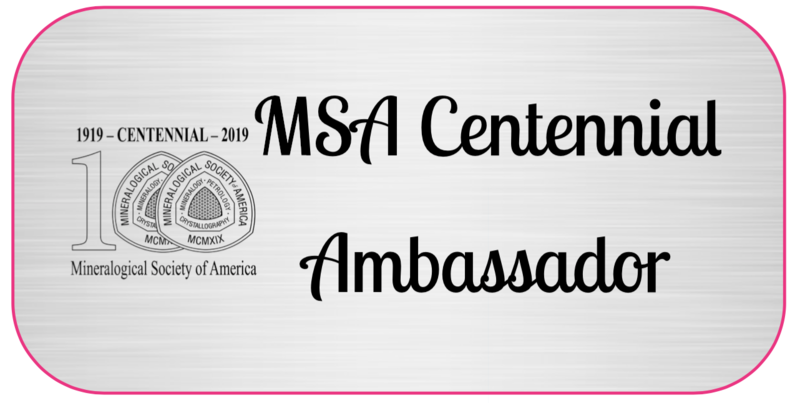 At the Phoenix GSA meeting, you can visit the MSA Booth and receive an MSA Centennial Ambassador badge, which you can wear proudly in the knowledge that you have contributed to our 100th birthday celebration. Let's celebrate MSA's birthday by reaching out to our communities and letting them know the important things we do!! Need an MSA Centennial logo for your presentation? Download one as a B&W jpg or as a MicroSoft PowerPoint slide with a either B&W, green, tan, Am Min yellow, or blue background. Kim Tait, Royal Ontario Museum. Title of her presentation: Making Mineral Collections Relevant in the 21st Century at the Tucson Gem and Mineral Show Society of Mineral Museum Professionals (SMMP) Meeting, Tucson, AZ, USA on February 14, 2019. Robert M. Hazen, Carnegie Institution for Science / George Mason University. Title of his presentation: The Story of Earth: How Life, Rocks, and the Carbon Cycle have Co-Evolved at the Geological Society of London Public Lecture Series 2019, London, England, UK on February 27. 2019. Ernst A. J. Burke, Haelen, The Netherlands. => Download "Mineralogical Society of America 100 jaar", from the April 2019 issue of the Belgian mineral magazine Geonieuws, v. 44, n 4, pp. 95-100. John Rakovan, Miami University (of Ohio). Title of his presentation: Forensic Mineralogy: Examples in Gold & Silver at the Friends of Mineralogy Midwest Chapter 7th Annual Mineral Symposium, Miami University, Oxford, OH, USA on March 9, 2019. John Rakovan, Miami University (of Ohio) and Barb Dutrow, Louisiana State University, Baton Rouge, LA. 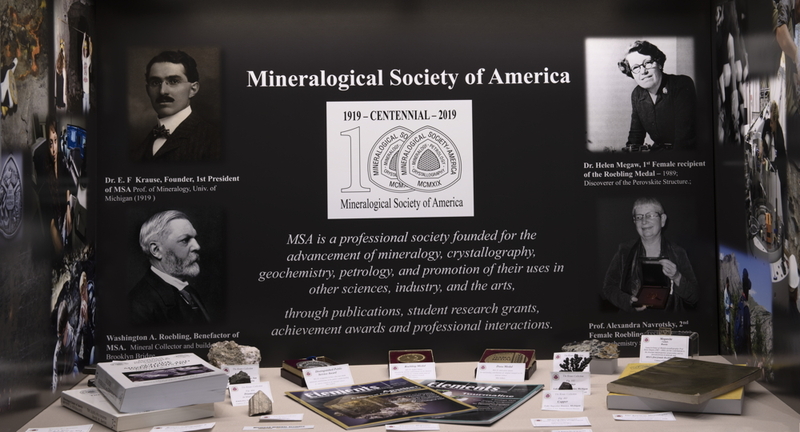 Assembled an MSA Centennial Display that occupied a case on the main floor of the 2019 Tucson Gem and Mineral Show. It showcased MSA publications and awards and had mineral specimens belonging to founder Kraus, major benefactor Roebling, minerals named after founder Kraus, and Roebling Medalists Helen Megaw and Alexandra Navrotsky. This MSA Centennial Display is now set up in the Limper Geology Museum, Miami University, Oxford, OH. It will remain on display through the early summer (with a hiatus when set up at the Cincinnati Mineral Society Geofaire in May, and possibly at the Rochester symposium in April). It will also be on display at the Midwest Friends of Mineralogy Symposium, Oxford, OH. Mark Van Baalen, Harvard University. Title of his presentation: Emeralds, Birthstones, and Salt at Harvard Alumni Office, Bogotá, Colombia on March 9, 2019. Michael Velbel, Michigan State University. Title of his presentation: Minerals, Meteorites, and Water in the Solar System at Okemos (Michigan) High School Earth Science class, Okemos, MI, USA on March 26, 2019. Elizabeth Johnson, James Madison University. Title of her presentation: Demystifying the Expert: Hilarious Interactions of Mystery Guest Scientist with JMU's comedic improvization troupe at the James Madison University Student Union, Harrisonburg, Virginia, USA on March 28, 2019, as part of JMU's Demystifying the Expert series. Peter J Heaney, Penn State University. Title of his presentation: From Coal to Diamonds? at the Junior Education Day -- Nittany Mineralogical Society, State College, PA, USA on March 30, 2019. John Rakovan, Miami University (of Ohio). Title of his presentation: Crystal Growth - A Primer at the Rochester Mineralogical Symposium, Rochester, NY USA on April 11, 2019. Elizabeth Johnson, James Madison University. Title of her presentation: Learning to Identify Minerals and Rocks at the James Madison University Student Union, Harrisonburg, VA, USA on April 12, 2019. This was to forty 8th graders participating in JMU's Valley Scholars Program for potential first-generation college students. John Rakovan, Miami University (of Ohio). Title of his presentation: Forensic Mineralogy: Examples in Silver and Gold at the Columbus Rock and Mineral Society meeting, Columbus, OH, USA on April 17, 2019.